'The definitive work on the British volunteers ...a superbly written and deeply moving vision of the inspiring but doomed efforts of men and women to halt Europe's descent into war.' Paul Preston, author of The Spanish Holocaust On 17 July 1936 a Nationalist military uprising was launched in Spain. In the face of the rebels' bloody onward march, the Spanish Republic turned to the leaders of Britain and France for assistance - but its pleas fell on deaf ears. Appalled at the prospect of another European democracy succumbing to fascism, volunteers from across the Continent - and beyond - flocked to Spain's aid, many to join the International Brigades. As many as 2,500 of these men and women came from Britain, Ireland and the Commonwealth, and contrary to popular myth theirs was not an army of adventurers, poets and public school idealists. Overwhelmingly they hailed from modest working-class backgrounds, leaving behind their families and livelihoods to fight in a brutal civil war on foreign soil. More than 500 of them never returned home. 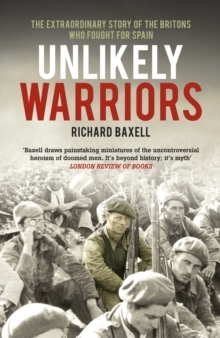 In this inspiring and moving oral history, Richard Baxell weaves together a diverse array of testimony to tell the remarkable story of the Britons who took up arms against General Franco. From their struggle against the Blackshirts in the 'hungry thirties', to the fall of the Nazis' Third Reich in 1945, Unlikely Warriors follows a band of ordinary men and women who made an extraordinary choice, and offers a startling new perspective on the Spanish Civil War.